The heavenly cloud sleeping Monica dreams that she can write comics in her sleep. My inability to full recharge my brain each night on a regular basis is an endless source of inspiration. Sorry if the final panel is too creepy. I promise you, it’s worse on the inside. I was up until 3:30 or 4 a.m. last night, and then up at 6 because the A/C finked out again and it’s still about 100 degrees here once the sun rises. And even though I fell back asleep after helping The Man fix it, FedEx rang the doorbell at 9. So my head is buzzing. Also started a new bulletin board and finished a Panels piece today. Ain’t no rest for the wicked. 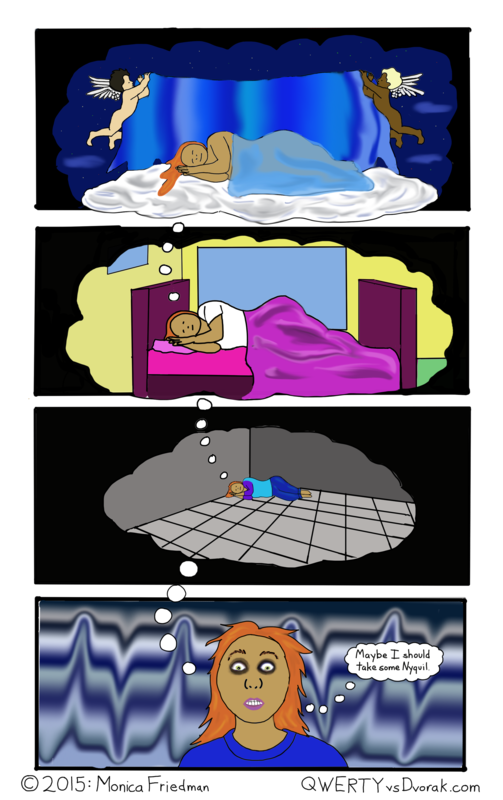 This entry was posted in webcomic and tagged comic, comics, insomnia, sleeping on September 30, 2015 by littledragonblue.